We got a new toy. In this picture, you can see me and Glinda modelling our latest cool purchase. This is a baby sling. 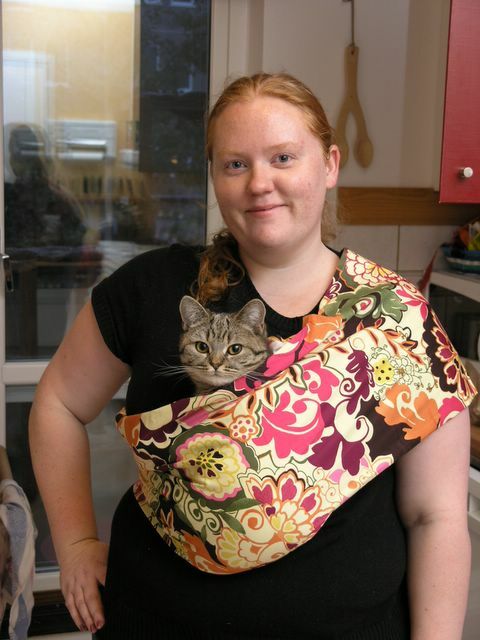 Or a kitty sling, as we prefer to call it. The idea struck me some time ago - a baby carrier thingy might work perfectly for carrying cats. Right? Glinda loves to cuddle, and she loves being carried around. This is especially evident at cat shows - and who can blame her, sitting in a cage all day isn't a lot of fun. However, Glinda's getting pretty heavy. So, a sling.. I ordered this one from Ebay, and I heartily recommend the seller. You'll find her listings here. We've only tried it out a little so far, but we LOVE it. Edith and Kelly enjoys rides in it too, while Ywette is a bit more sceptical. Hamlet is just too big, there's no way he's going to fit. But the rest... oh, not bad. I think I'll train all my future kittens to be sling-carried! See more lovely cats at Clare Eats! I love your blog. So much fantastic-looking food! The sling for i.e. catshows seems to be a great idea! I just love your kitty sling! lol thats the cutest kitty carrying contraption ive ever seen! How cute! I love that carrier! What a cute way to carry a cat indeed! That is such a fantastic idea Anne. I love the way Glinda is peeking out from that colourful sling. That is one mellow cat!